Welcome to the travelogue of my second trip to the Mediterranean. To view a larger version of the photos on the following pages click on the thumbnail image. There's no need to close the pop-up window each time as the window will automatically resize when you select a different photo. However, you may need to reposition the photo by dragging on the grey header. You can also view a satellite image of the location by clicking on the globe icon. If you have Google Earth installed, you can download the companion guide to view the exact location of the many destinations on this trip along with photos and links back to this travelogue. 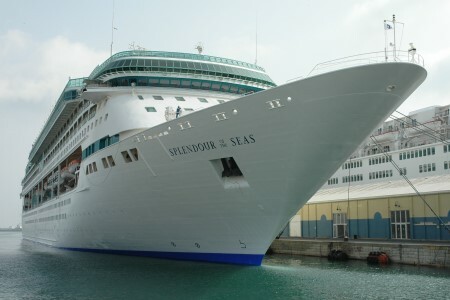 From May 15 to May 21 I cruised the Mediterranean aboard Royal Caribbean's Splendour of the Seas with Amazing Journeys. This is the same ship and the same group I went on two years ago on my last Mediterranean trip. I had such a good time on the previous journey I decided to do it again, although visiting different ports. 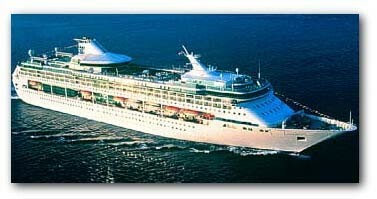 The Splendour of the Seas is an amazing ship. At 867 feet long it has room for over 2000 passengers with 11 decks, a rock-climbing wall, glass-walled dining rooms, a casino, two swimming pools, even an 18-hole miniature golf course. 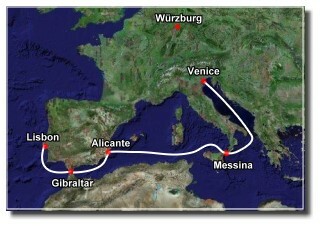 Our ports-of-call were Lisbon Portugal, Gibraltar UK (have to see the rock), Alicante Spain, Messina Sicily, and finally Venice Italy. I also took a post trip to Würzburg Germany so I could visit my sister.